Smart Reply, my favorite Gmail feature that lets you respond to emails by simply tapping on a contextually relevant message, is coming to a bunch more apps, thanks to Google’s experimental division, Area120, reports Android Police. The new superpower will arrive in the form of Reply, an app that the company is slated to begin testing soon. 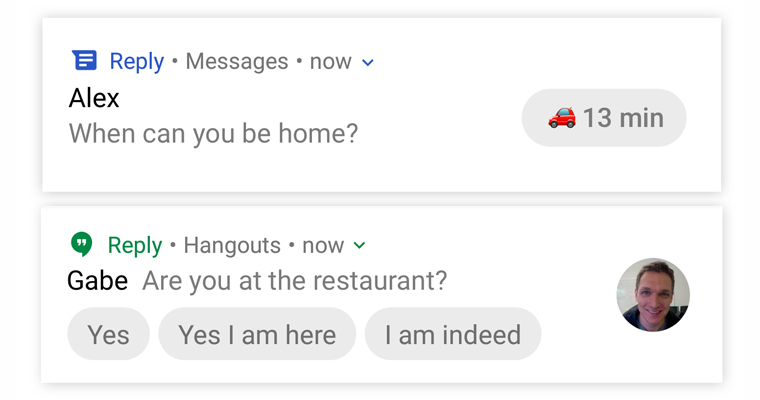 Essentially, it’ll let you reply to messages in apps like Hangouts, WhatsApp, and Facebook Messenger, by tapping on buttons with short replies that are meaningful in the context of the conversation you’re having with your contacts – straight from your notifications. There are a couple more interesting features planned, including a Do Not Disturb mode that’s automatically turned on when you’re driving to silence your phone and alert those who message you that you can’t text right then; critical messages like, “We’re waiting for you!” will trigger an alert even if your phone is set to silent; a vacation responder will automatically let people know you’re off the clock by checking your calendar. As someone who’s trying to use their phone less, I can’t wait for Reply to arrive. It’ll likely only be available for Android, though, and Google says it’s still very early days, so we may have to wait a while. Google previously introduced similar functionality in Inbox for Gmail, as well as Allo and Android Messages. The company roped in inventor Ray Kurzweil to build Smart Reply for Gmail a while ago, but it seems like this might be a different team working on the upcoming app. You can sign up here to request early access to Reply; let us know if you get to give it a shot.